Driveway damaged and need concrete raised. Void under driveway as well as cracking in driveway concrete. Area of sidewalk has lowered as well. I have side walk that has sunk lower then the curb all around the building. I have a curb that needs to be repaired and I have expansion joint that needs filling in. Pool slab sinking and showing signs of separation near pool. Needs attention. I have a square slab between my front porch and sidewalk. Size is about 6 ft x 6 ft. It is out of level and I would like to use foam leveling. Need someone to look at it and give me a price. I have a 10x30 patio with a couple cracks that needs leveling. Sinking driveway due to erosion underneath. Driveway: One section out of four is sinking in. Adjacent sidewalk is caving in. Front walkway from driveway to porch is sinking. Driveway cracked and sinking in many areas. If I need to get an estimate on my front porch stoop as well as a section of my driveway that has sunken. I have a section of my driveway that has settled. Looking for long term fix to our foundation issues. We are very interested in the Polylevel jacking for our needs. Have tried other band-aid fixes in past & nothing has given a good solution our foundation needs. We have cracks in walls & ceiling where you can see light coming thru. Driveway uneven. House shifting causing cracks in fireplace or window issues also. We looking for estimates & resolution to our needs to make the best decision moving forward. A large portion of my driveway has nothing supporting it, the dirt has eroded away and left a hollow area. I would like my pool decking and my back porch looked at. I would like a quote to raise the walkway to the house and to fill the cracks in the driveway. Walk way leading to the house has a couple parts that are lower than others and catching water. Driveway needs to be raised and crack filled. I'm excited to have found Poly Level and would to talk to someone to see if it will work for some unique issues Inhabe with my driveway. Thank you! I have one section of sidewalk in the front of my home that presents a trip hazard.....would like to have it foam lifted to meet the other sections. Area of section of concrete that has sunken is 4ft x 3ft and it appears it only needs to be lifted at one end seam. I am experiencing some settling issues around our home built in 1993. A pool deck, a drive way, and a couple of walkway sections. Can you help us with a quote please? Thank you. Concrete Leveling & Repair in Arlington, TX! PolyLEVEL™ is a less abrasive and cost-saving alternative to concrete lifting & leveling. The entire concrete lifting process is less destructive and offers numerous benefits over typical slab raising methods. 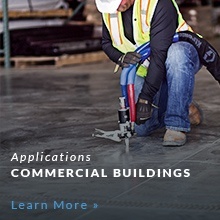 Our Arlington contractors are the only professionals trained and to provide the PolyLEVEL™ concrete lifting solution. Mudjacking, or pressure grouting, are solutions that require the demolition and replacement of an entire slab of concrete, a procedure that is time consuming and expensive. 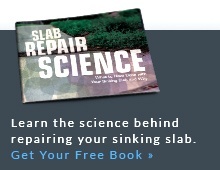 PolyLevel’s two-part foam expands instantaneously upon injection beneath a settled slab. The injection holes are small and much less abrasive than those required for mud jacking. During the injection process, PolyLEVEL expands many times its original volume, forcing the sunken concrete back to its initial level. It takes only a matter of minutes for the polymer to expand and reach more than 90% of its firmness! Comment: Driveway damaged and need concrete raised. Comment: Void under driveway as well as cracking in driveway concrete. Area of sidewalk has lowered as well. Comment: I have side walk that has sunk lower then the curb all around the building. I have a curb that needs to be repaired and I have expansion joint that needs filling in. Comment: Pool slab sinking and showing signs of separation near pool. Needs attention. Comment: I have a square slab between my front porch and sidewalk. Size is about 6 ft x 6 ft. It is out of level and I would like to use foam leveling. Need someone to look at it and give me a price. Comment: I have a 10x30 patio with a couple cracks that needs leveling. Comment: Sinking driveway due to erosion underneath. Comment: Driveway: One section out of four is sinking in. Adjacent sidewalk is caving in. Front walkway from driveway to porch is sinking. Comment: Driveway cracked and sinking in many areas. Comment: If I need to get an estimate on my front porch stoop as well as a section of my driveway that has sunken.